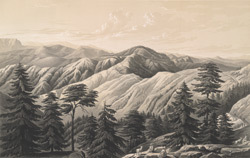 This lithograph is taken from plate 9 of 'Views in the Himalayas' by Mrs WLL Scott. This view of Jakhu Hill and the Simla cantonment was made from the cottage of Captain Metcalf, who was aide-de-camp to the Governor-General, Lord Dalhousie. Shimla in the Himalayan foothills was originally a small village named after the goddess Shamla Devi, an incarnation of Kali. When the British discovered it in 1819, they developed it as a summer refuge from the hot plains of India, and a place of recuperation for battle-weary soldiers. Jakhu Hill was associated by Hindus with the mythology of Hanuman to whom the local temple was dedicated. At 2,455 metres tall, the hill provides fine views of the town and valley.